Uk’s Kalender is a simple Portable Calendar and Event Reminder. It can of course be used to remind you of important events, Birthdays, to do lists and daily tasks. 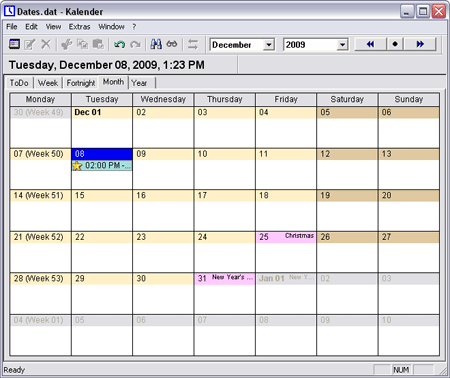 The Calendar utilizes it’s own database. Key features include; repeating events, option to set event duration, forwarn time with snooze function, selectable icons, auto insertion of Holidays. Weekly, Monthly and Yearly view options are available. Make sure to get the No-Install version in your language.